Semarang, 6 December 2018 – Monokrom Printing, located in Jl. Citarum No. 41 Semarang is officially launched. 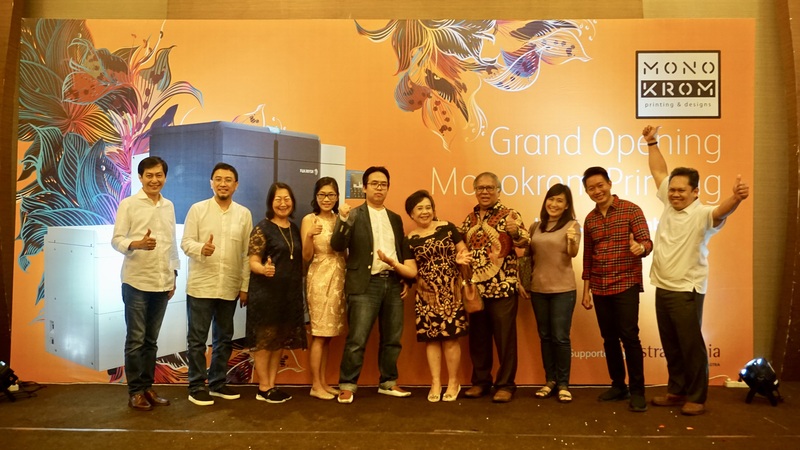 Presenting the new breakthrough in print shop business in Semarang and Central Java, Monokrom Printing comes with Fuji Xerox Iridesse™ Production Press machine from Astragraphia Document Solution as its product hero. Astragraphia that is well-known as the leader in the industry is committed to supporting the growth of the graphic business, especially in Semarang. Since 2013, Semarang has initiated Semarang Smart City program, digital-based integrated city management. One of the indicators in this program is “Smart Economy” that focuses on the growth of Semarang’s economy. Speaking of a region’s economy, it is closely related to the SME’s growth. According to the report of Service of Cooperatives and SMEs in Semarang, currently, there are more than 14.000 SMEs in the city with 2.000 new SMEs addition every year. “Just like Astragraphia, here we also focus on consumer experience for our customers. We strive to provide premium service and homie interior design, so we can be able to build a friendly atmosphere and make customers feel comfortable to choose Monokrom as the preferred printing vendor. " Central Statistic Body (Badan Pusat Statistik) reported in the third quarter of 2017, packaging business contributes almost 50% of the total revenue in the printing industry. This business also continues to grow positively when compared to businesses with offset printing such as books, magazines, banners, and so on. Based on the report, the packaging business is predicted to become the main segment in the graphics industry. This underlies business people to start investing in digital machines. Eko Wahyudi Santoso, Chief of Business Operation-2 PT Astra Graphia Tbk said, "We are committed to delivering innovations that can support the creation of a dynamic business ecosystem. One of our superior machines is Fuji Xerox Iridesse™ Production Press with high features and specifications so customers need not hesitate when pouring their designs from the digital version for printing." With the newly developed single-pass, six-color print engine, Iridesse™ Production Press can print eye-catching images with the xerographic color printing process by using up to two special dry inks selected from gold, silver and clear in addition to the common cyan, magenta, yellow and black (CMYK). Going forward, white dry ink will also be added to the specialty dry ink lineup to accommodate printing on dark colored or other specialty papers. Compared to prints using only conventional CMYK dry inks, adopting special dry inks expands the range of expression, produces a premium finishing and provides more sense of seasonality of the printed images, which adds value for effective marketing activities. The ability of paper grammars up to 400gsm and paper sizes up to 1,200mm, of course, will expand the document printing application for a limited number of packaging needs such as carton packaging boxes commonly found in the culinary, fashion, and other special events. Astragraphia Document Solution launches color printer Fuji Xerox DocuPrint CP505 d and monochrome printer DocuPrint P505 d, DocuPrint P285 dw, and DocuPrint M285 z in Indonesia. Iridesse™ Production Press is a high-end printer for professionals. Astragraphia and Fuji Xerox introduced the Smart Work Gateway concept.